Helsinki, 15.2.2018 Icareus has delivered a turnkey HbbTV solution to Emitel, the national terrestrial TV network operator in Poland. 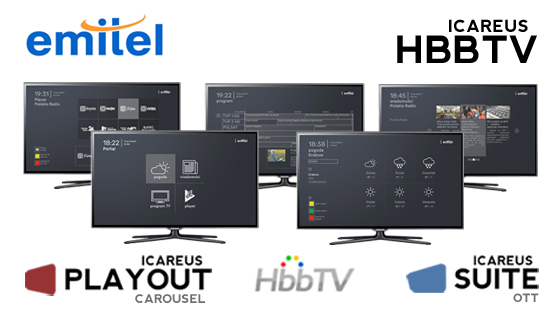 With the new Icareus system Emitel is start the HbbTV service offering for TV viewers in Poland. The delivered turnkey HbbTV (www.hbbtv.org) solution enable Emitel to offer their broadcaster customers HbbTV services and applications as a cloud service. For broadcasters it offers a versatile, fast and reliable HbbTV deployment. Icareus HbbTV solution was selected as it offer Emitel an economical, production tested and feature rich platform to provide HbbTV services to its customers. For operations it provides easy-to-use user interface and tools to customise the services for each of Emitel’s customers without software development, making service expansion hassle free. The delivered solution consists of Icareus Playout CS100 broadcast head-end for HbbTV streaming, Icareus Suite for HbbTV service management, online streaming servers and an assortment of HbbTV services. Icareus Suite, Online Video and TV Platform, is a complete solution targeted for broadcasters and network operators to manage their hybrid and OTT services. Icareus Suite was installed on-site for Emitel to offer HbbTV as a cloud services to their customers. Icareus Suite provides easy-to-use web interface to manage and customise HbbTV services, including Addressable TV advertising. Application templates can be quickly adopted to any TV channel brand and look-and-feel without any programming, making it optimal for service providers. The modules included to Emitel delivery include e.g. HbbTV Application, VOD and Catch-up TV, Device, Channel and EPG management. Additional modules like pay TV provisioning, subscriber, and account management can be added at later stage. The advanced audience monitoring module offer insight on how viewers use HbbTV applications. Icareus Suite was integrated with Wowza Media Server to provide Live and On-Demand streaming. Icareus Playout Carousel offers Trusted Broadcast Technology enjoyed by leading broadcasters and operators globally for over a decade. Icareus’ Playout CS100 Carousel™ is the solution for TV operators and broadcasters for DVB interactive datacasting services. Icareus’ Playout CS100 Carousel Server allows the building and supervision of high quality value-added television services by multiplexing data in real-time. Icareus’ Playout CS100 Carousel server supports HbbTV and other interactive TV standard based applications. Launcher application, which is autostarted on all channels and takes control of desired buttons (color buttons mainly). Each button can be assigned a scheduled action. Includes support for Addressable TV formats like SwitchIn, ActiveAd and VideoSwap. Linear Broadband channels service providing an opportunity to have niche TV and Radio channels over IP to HbbTVs. News service providing the latest Polish news from RSS sources. Weather…well you know what is a weather application.